1. Linguistic change is not to be identified with random drift proceeding from inherent variation in speech. Linguistic change begins when the generalization of a particular alternation in a given subgroup of the speech community assumes direction and takes on the character of orderly differentiation. 2. The association between structure and homogeneity is an illusion. Linguistic structure includes the orderly differentiation of speakers and styles through rules which govern variation in the speech community; native command of the language includes the control of such heterogeneous structures. 3. Not all variability and heterogeneity in language structure involves change; but all change involves variability and heterogeneity. 4. The generalization of linguistic change throughout linguistic structure is neither uniform nor instantaneous; it involves the covariation of associated changes over substantial periods of time, and is reflected in the diffusion of isoglosses over areas of geographical space. 5. The grammars in which linguistic change occurs are grammars of the speech community. Because the variable structures contained in language are determined by social functions, idiolects do not provide the basis for self-contained or internally consistent grammars. 6. Linguistic change is transmitted within the community as a whole; it is not confined to discrete steps within the family. Whatever discontinuities are found in linguistic change are the products of specific discontinuities within the community, rather than inevitable products of the generational gap between parent and child. 7. Linguistic and social factors are closely interrelated in the development of language change. Explanations which are confined to one or the other aspect, no matter how well constructed, will fail to account for the rich body of regularities that can be observed in empirical studies of language behavior. (1) No non-lexical language property can be borrowed unless the borrowing language already includes borrowed lexical items from the same source language. (2) No member of a constituent class whose members do not serve as domains of accentuation can be included in the class of properties borrowed from a particular source language unless some members of another constituent class are also so included which do serve as domains of accentuation and which properly include the same members of the former class. (3) No lexical item that is not a noun can belong to the class of properties borrowed from a language unless this class also includes at least one noun. (4) A lexical item whose meaning is verbal can never be included in the set of borrowed properties. (5) No inflectional affixes can belong to the set of properties borrowed from a language unless at least one derivational affix also belongs to the set. (6) A lexical item that is of the "grammatical" type (which type includes at least conjunctions and adpositions) cannot be included in the set of properties borrowed from a language unless the rule that determines its linear order with respect to its head is also so included. (7) Given a particular language, and given a particular constituent class such that at least some members of that class are not inflected in that language, if the language has borrowed lexical items that belong to that constituent class, at least some of these must also be uninflected. ・ Moravcsik, Edith A. "Language Contact." Universals of Human Language. Ed. Joseph H. Greenberg. Vol. 1. Method & Theory. Stanford: Stanford UP, 1978. 93--122. The neolinguists assert that linguistic creations, whether phonetic, morphological, syntactic, or lexical, spread by imitation. Imitation is not a slavish copying; it is the re-creation of an impulse or spiritual stimulus received from outside, a re-creation which gives to the linguistic fact a new shape and a new spirit, the imprint of the speaker's own personality. In the present study, two or more languages will be said to be IN CONTACT if they are used alternately by the same persons. The language-using individuals are thus the locus of the contact. The rapid increase in the number of independent European nation-states in the past hundred years or so has therefore been paralleled by a rapid growth in the number of autonomous, national and official languages. During the nineteenth century the number rose from sixteen to thirty, and since that time has risen to fifty. A group of men is sitting on a beach facing the sea. They are there for some hours and little is said. After a long period of silence someone says: "Tide's coming in." Some of the group murmur "Yes" but most remain silent. After another very long pause someone says "Tide's coming in". And there is some scattered response. This happens many times until someone says: "Must be tide's going out." Historical pragmatics (HP) is a field of study that investigates pragmatic aspects in the history of specific languages. It studies various aspects of language use at earlier stages in the development of a language; it studies the diachronic development of language use; and it studies the pragmatic motivations for language change. ・ Jucker, Andreas H. "Historical Pragmatics." Variation and Change. Ed. Mirjam Fried et al. Amsterdam: Benjamins, 2010. 110--22. The Embedding Problem. There can be little disagreement among linguists that language changes being investigated must be viewed as embedded in the linguistic system as a whole. The problem of providing sound empirical foundations for the theory of change revolves about several questions on the nature and extent of this embedding. (a) Embedding in the linguistic structure. If the theory of linguistic evolution is to avoid notorious dialectic mysteries, the linguistic structure in which the changing features are located must be enlarged beyond the idiolect. The model of language envisaged here has (1) discrete, coexistent layers, defined by strict co-occurrence, which are functionally differentiated and jointly available to a speech community, and (2) intrinsic variables, defined by covariation with linguistic and extralinguistic elements. The linguistic change itself is rarely a movement of one entire system into another. Instead we find that a limited set of variables in one system shift their modal values gradually from one pole to another. The variants of the variables may be continuous or discrete; in either case, the variable itself has a continuous range of values, since it includes the frequency of occurrence of individual variants in extended speech. The concept of a variable as a structural element makes it unnecessary to view fluctuations in use as external to the system for control of such variation is a part of the linguistic competence of members of the speech community. (b) Embedding in the social structure. The changing linguistic structure is itself embedded in the larger context of the speech community, in such a way that social and geographic variations are intrinsic elements of the structure. In the explanation of linguistic change, it may be argued that social factors bear upon the system as a whole; but social significance is not equally distributed over all elements of the system, nor are all aspects of the systems equally marked by regional variation. In the development of language change, we find linguistic structures embedded unevenly in the social structure; and in the earliest and latest stages of a change, there may be very little correlation with social factors. Thus it is not so much the task of the linguist to demonstrate the social motivation of a change as to determine the degree of social correlation which exists, and show how it bears upon the abstract linguistic system. (2) The Transition Problem. "Between any two observed stages of a change in progress, one would normally attempt to discover the intervening stage which defines the path by which Structure A evolved into Structure B" (184) ．transition と呼ばれるこの過程は，A と B の両構造を合わせもつ話者を仲立ちとして進行し，他の話者（とりわけ次の年齢世代の話者）へ波及する．その過程には，次の3局面が含まれるとされる．"Change takes place (1) as a speaker learns an alternate form, (2) during the time that the two forms exist in contact within his competence, and (3) when one of the forms becomes obsolete" (184). (4) The Evaluation Problem. 言語変化がいかに主観的に評価されるかの問題．"[T]he subjective correlates of the several layers and variables in a heterogeneous structure" (186) . また，言語変化や言語変異に対する好悪や正誤に関わる問題や意識・無意識の問題などもある．"[T]he level of social awareness is a major property of linguistic change which must be determined directly. Subjective correlates of change are more categorical in nature than the changing patterns of behavior: their investigation deepens our understanding of the ways in which discrete categorization is imposed upon the continuous process of change" (186) . What Hymes offers us in his SPEAKING formula is a very necessary reminder that talk is a complex activity, and that any particular bit of talk is actually a piece of 'skilled work.' It is skilled in the sense that, if it is to be successful, the speaker must reveal a sensitivity to and awareness of each of the eight factors outlined above. Speakers and listeners must also work to see that nothing goes wrong. When speaking does go wrong, as it sometimes does, that going-wrong is often clearly describable in terms of some neglect of one or more of the factors. Since we acknowledge that there are 'better' speakers and 'poorer' speakers, we may also assume that individuals vary in their ability to manage and exploit the total array of factors. It were a thing verie praiseworthie in my opinion, and no lesse profitable then praise worthie, if som one well learned and as laborious a man, wold gather all the words which we vse in our English tung, whether naturall or incorporate, out of all professions, as well learned as not, into one dictionarie, and besides the right writing, which is incident to the Alphabete, wold open vnto vs therein, both their naturall force, and their proper vse . . . .
For the words, which concern the substance thereof: I haue gathered togither so manie of them both enfranchised and naturall, as maie easilie direct our generall writing, either bycause theie be the verie most of those words which we commonlie vse, or bycause all other, whether not here expressed or not yet inuented, will conform themselues, to the presidencie of these. Then secondli a writing is corrupted, when yt hath more letters than the pronunciation neadeth of voices: for by souch a disordre a writing can not be but fals: and cause that voice to be pronunced in reading therof, which is not in the word in commune speaking. This abuse is great, partly without profit or necessite, and but oneli to fill up the paper, or make the word thorow furnysshed with letters, to satisfie our fantasies . . . . As breifli for example of our superfluite, first for derivations, as the b in doubt, the g in eight, h in authorite, l in souldiours, o in people, p in condempned, s in baptisme, and divers lyke. ・Hart, John. MS British Museum Royal 17. C. VII. The Opening of the Unreasonable Writing of Our Inglish Toung. 1551. In John Hart's Works on English Orthography and Pronunciation [1551, 1569, 1570]: Part I. Ed. Bror Danielsson. Stockholm: Almqvist & Wiksell, 1955. 109--64. Already in 19th century Indo-European studies contact appears as an explanation for change though by and large mainstream Indo-Europeanists preferred language-internal accounts. One should stress that strictly speaking contact is not so much an explanation for language change as a suggestion for the source of a change, that is, it does not say why a change took place but rather where it came from. For instance, a language such as Irish or Welsh may have VSO as a result of early contact with languages also showing this word order. However, this does not explain how VSO arose in the first place (assuming that it is not an original word order for any language). The upshot of this is that contact accounts frequently just push back the quest for explanation a stage further. Considerable criticism has been levelled at contact accounts because scholars have often been all too ready to accept contact as a source, to the neglect of internal factors or inherited features within a language. This readiness to accept contact, particularly when other possibilities have not been given due consideration, has led to much criticism of contact accounts in the 1970s and 1980s . . . . However, a certain swing around can be seen from the 1990s onwards, a re-valorisation of language contact when considered from an objective and linguistically acceptable point of view as demanded by Thomason & Kaufman (1988) . . . .
・ Hickey, Raymond. "Language Change." Variation and Change. Ed. Mirjam Fried et al. Amsterdam: Benjamins, 2010. 171--202. The assumption of endogeny, being generally the preferred hypothesis, functions in practice as the default hypothesis. Thus, if some particular change in history cannot be shown to have been initiated through language or dialect contact involving speakers, then it has been traditionally presented as endogenous. Usually, we do not know all the relevant facts, and this default position is partly the consequence of having insufficient data from the past to determine whether the change concerned was endogenous or externally induced or both: endogeny is the lectio facilior requiring less argumentation, and what Lass has called the more parsimonious solution to the problem.
. . . seemingly paradoxically --- it happens that, in order to define those aspects of change that are indeed endogenous, we need to specify much more clearly than we have to date what precisely are the exogenous factors from which they are separated, and these include the role of the speaker/listener in innovation and diffusion of innovations. It seems that we need to clarify what has counted as 'internal' or 'external' more carefully and consistently than we have up to now, and to subject the internal/external dichotomy to more critical scrutiny. There may be no empirical way of showing that language changes independently of social factors, but it has not primarily been my intention to demonstrate that endogenous change does not take place. The one example that I have discussed has shown that there are some situations in which it is necessary to adduce social explanations, and this may apply very much more widely. I happen to think that social matters are always involved, and that language internal concepts like 'drift' or 'phonological symmetry' are not explanatory . . . .
・ Milroy, James. "On the Role of the Speaker in Language Change." Motives for Language Change. Ed. Raymond Hickey. Cambridge: CUP, 2003. 143--57.
. . . it was proposed that borrowing hierarchies are sensitive to functional properties of discourse organization and speaker-hearer interaction. Items expressing contrast and change are more likely to be borrowed than items expressing addition and continuation. 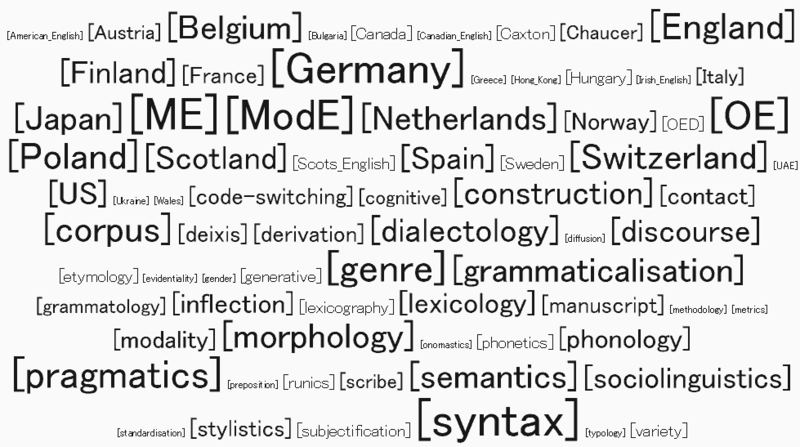 Discourse markers such as tags and interjections are on the whole more likely to be borrowed than conjunctions, and categories expressing attitudes to propositions (such as focus particles, phrasal adverbs like still or already, or modals) are more likely to be borrowed than categories that are part of the propositional content itself (such as prepositions, or adverbs of time and place). Contact susceptibility is thus stronger in categories that convey a stronger link to hearer expectations, indicating that contact-related change is initiated through the convergence of communication patterns . . . . In the domain of phonology and phonetics, sentence melody, intonation and tones appear more susceptible to borrowing than segmental features. One might take this a step further and suggest that contact first affects those functions of language that are primary or, in evolutionary perspective, primitive. Reacting to external stimuli, seeking attention, and seeking common ground with a counterpart or interlocutor. Contact-induced language change thus has the potential to help illuminate the internal composition of the grammatical apparatus, and indeed even its evolution. There are . . . significant reasons for not lumping expanded pidgins and creoles in the same category, usually identified as creole and associated with the fact that they have acquired a native speaker population. . . . [T]hey evolved in opposite directions, although they are all associated with plantation colonies, with the exception of Hawaiian Creole, which actually evolved in the city . . . . Creoles started from closer approximations of their 'lexifiers' and then evolved gradually into basilects that are morphosyntactically simpler, in more or less the same ways as their 'lexifiers' had evolved from morphosyntactically more complex Indo-European varieties, such as Latin or Old English. According to Chaudenson (2001), they extended to the logical conclusion a morphological erosion that was already under way in the nonstandard dialects of European languages that the non-Europeans had been exposed to. On the other hand, expanded pidgins started from rudimentary language varieties that complexified as their functions increased and diversified. creole が，印欧諸語の単純化の偏流 (drift) の論理的帰結であるという主張は目から鱗が落ちるような視点だ．Mufwene の次の指摘にも目の覚める思いがする．"Had linguists remembered that the European 'lexifiers' had actually evolved from earlier, more complex morphosyntaxes, they would have probably taken into account more of the socioeconomic histories of the colonies, which suggest a parallel evolution" (48) . ・ Mufwene, Salikoko. "Creoles and Creolization." Variation and Change. Ed. Mirjam Fried et al. Amsterdam: Benjamins, 2010. 46--60. ・ Kearns, Kate. "Implicature and Language Change" Variation and Change. Ed. Mirjam Fried et al. Amsterdam: Benjamins, 2010. 123--40.